Can you overdose on diet pills? How far will some go! The number of overweight or obese people is greater than ever before. This problem has not passed unnoticed by pharmaceutical companies that make multi-billion dollar industries by producing diet pills. Today, there are hundreds of different types of diet pills available, which many see as an easy and fast way to melt away the extra pounds. But, all is not well in the land of easy solutions. Diet pills can cause multiple side-effects which include physical and psychical addiction and overdose. Why are Diet Pills Harmful? Obese and overweight people are predominantly those who abuse diet pills, but so are the people who do not have actual weight problems (they only think they do). No matter the age group or gender, people with eating disorders are more likely to take more pills than necessary to speed up the weight loss process. Can Diet Pills Cause Death? There are multiple death cases reported due to diet pill overdose. Pulmonary hypertension or cardiac arrest cause fatal consequences. Pulmonary hypertension is a type of high blood pressure that affects the lung arteries. Taking too many diet pills can intensify this symptom and end fatally. Diet pills may also cause your heart to stop— after an increased dose of diet pills, the heart suffers enormous pressure and becomes unable to function properly. If you overdose on diet pills, do not seek advice on forums, but immediately call 9-1-1 or a poison control center. Do not induce vomiting, because sometimes that can only make things worse. After detoxification and medical treatment, think about what happened to you, and whether it is worth the risk. Do not work against your body, but help your organism by being objective, exercising and eating properly. 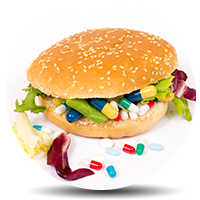 Addiction Resource » Addictive Substances: The Anatomy of Drug Addiction » The Dangers of Dieting: Diet Pill Abuse and Addiction » Can you overdose on diet pills? How far will some go! Out of curiosity, I’ve been taking these pills that have had no effect on my body at all. I took multiple at once – stupid, i know, but hear me out – and yet i feel literally NO effect on my body. Is it possible that I have been sold placebos? They are NOT prescription, just big-ish white capsules that I bought for about $30. I have used hydroxicut black otc at walmart off and on for abt 17 months alternating with GNCs lean fire off and on. I also half a*s exercise, i eat Balanced meals and drink lots of water. I went from 212 lbs down to 140 lbs is what im at now, holding steady, feeling great and i also take Dr Appt multi vitamin everyday for women! Good luck, be safe, be patient and most of all dont be hard on yourslf! Hey anon, most likely they are just supplements, Highly recommend you read the ingredients list. Mine are exactly like placebos, they only have natural ingredients and herbs. Hey, even if they don’t work at weight loss at least your getting nutrients if thats the type you bought. Hi AK2005. Please don’t take these types of pills at such a young age. Try eating a clearner diet and exercising 3-5x a week. I started to take wheight loss pills around your age and wish I would have never started. They have cause me a lot of health issues. Causing my family and I a lot of heart ace. You are at a healthy weight. But if you feel you are not try a more natural and positive approach to losing wheight. Try lifting weights in a gym and have a positive outlook of getting strong and healthy rather then the number on the scale. Mind over matter. It will change your life. Best of luck to you.